Today I spent a few hours back in my classroom to make sure we are set for the new year! Ok, ok I needed to get into the building mostly because I ran out of the room in December with a red and green glitter trail behind me. Thankfully it wasn’t as bad as my back to school nightmares had lead me to believe! It may be the first time in a decade that I didn’t rearrange more than student desks. 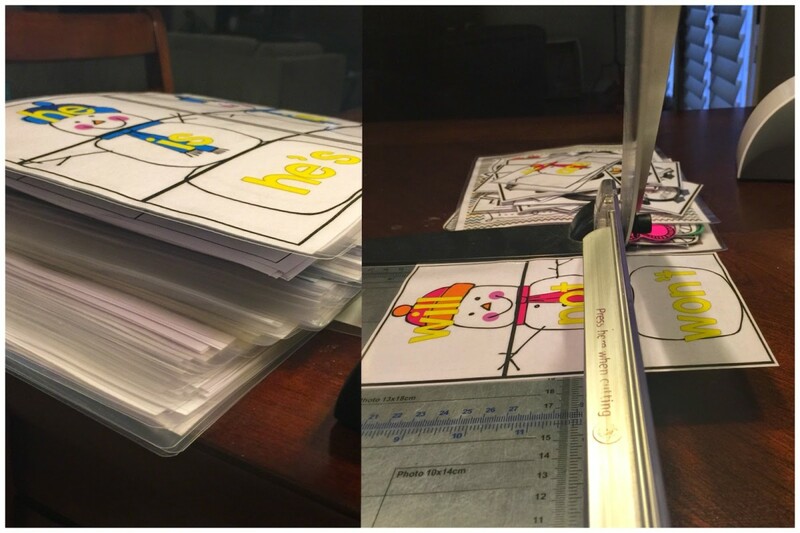 The good news is that I got through this monster stack of lamination last night and was able to get everything organized in the classroom today. 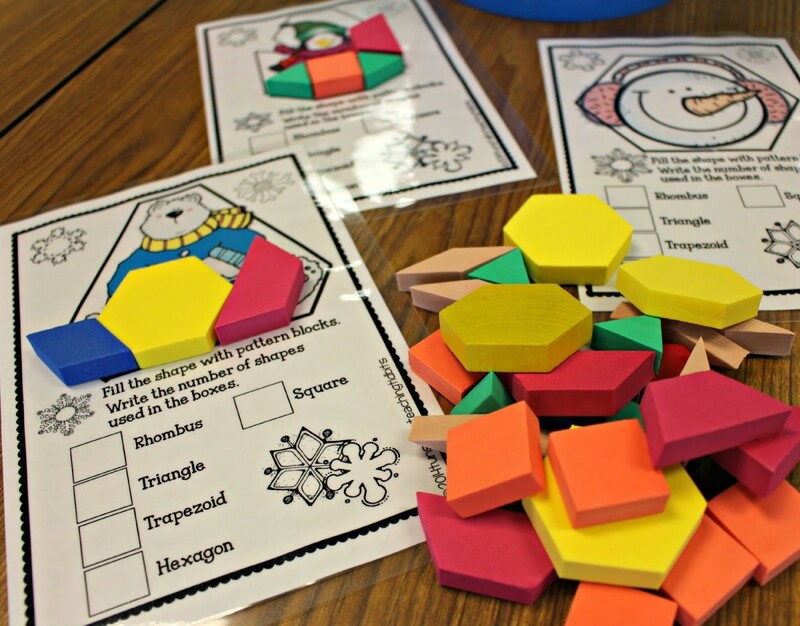 As we head back, our first concept in math will be 2D shapes and then 3D shapes. 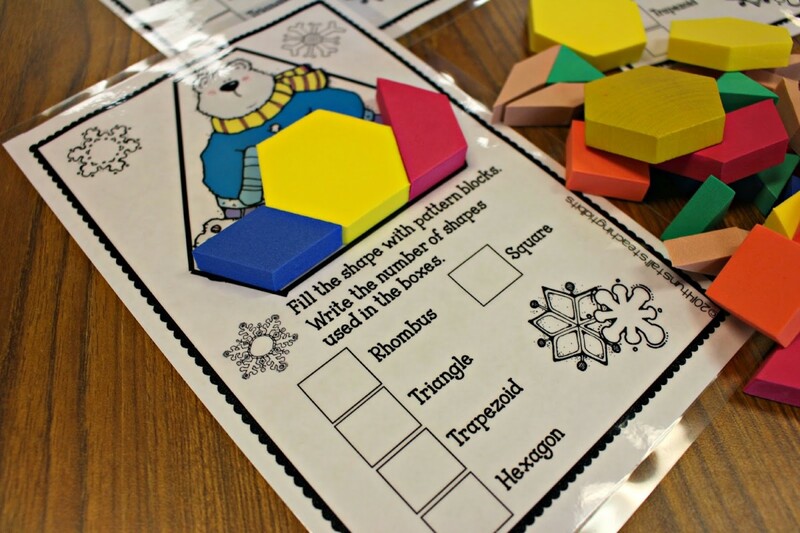 I made sure to get into my Geometry Math Resource to pull out my shapes for lessons on the rug. 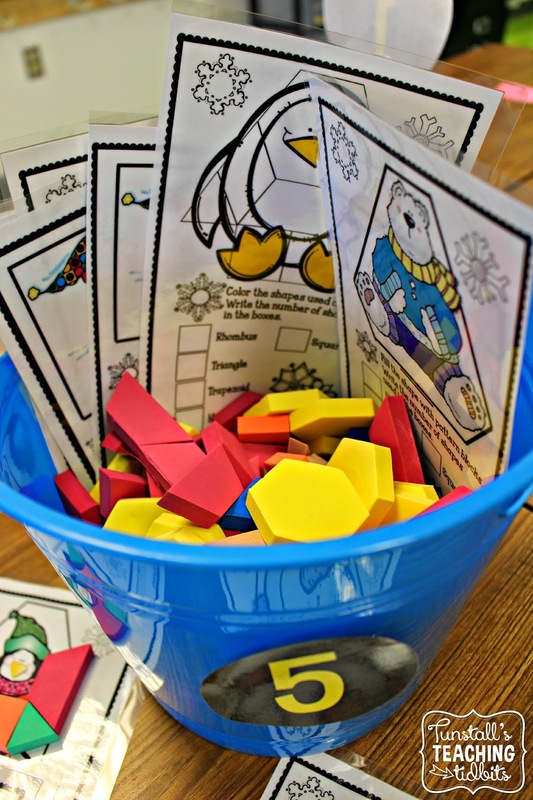 These shapes will also serve as reference for students while working on math journals. Can we just take a moment and thank Scholastic for making black pocket charts?! My eyes are happy. 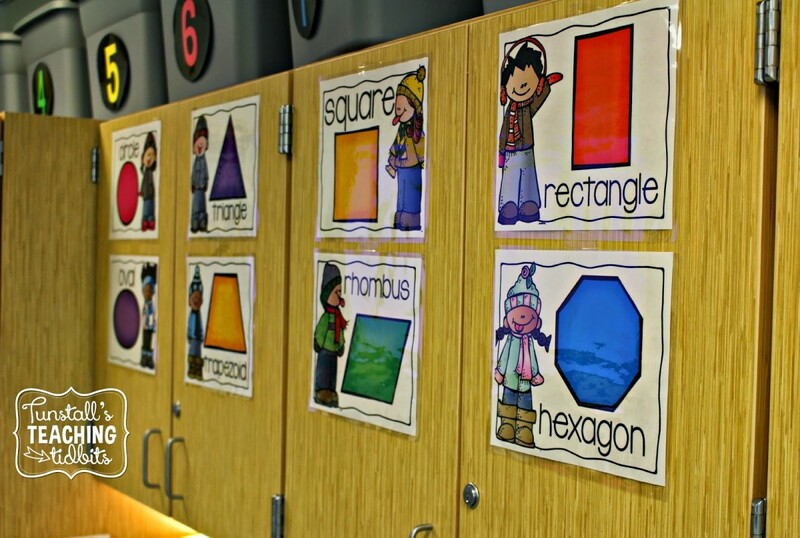 Our big idea cards all about shapes. This makes life easier when I am in the throes of teaching. Next I moved on to filling my new blue buckets. I started the year off with yellow buckets and I liked it. a. lot. But I get a little antsy and I love change. These blue buckets are bright but wintery so they fit the bill! I found them at the Dollar Store last year at this time. 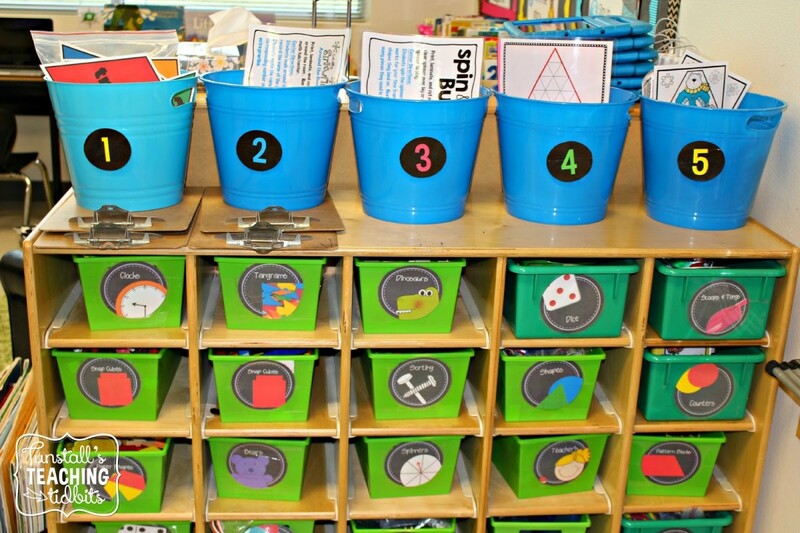 My buckets have 2D centers from my newest math unit, 2D and 3D Shapes. Here’s a peek inside. I had a little too much fun setting up. 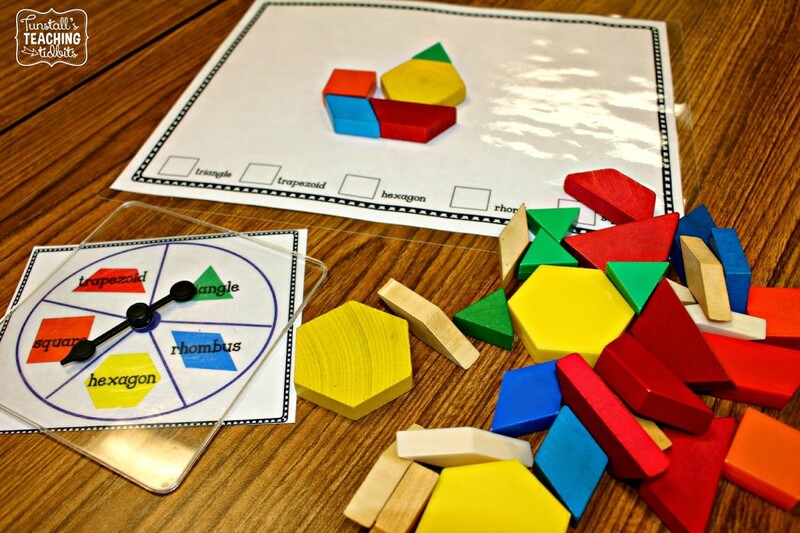 The first half of the week I am going to be really working on every student knowing the names and attributes of the shapes. 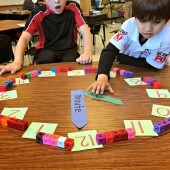 These independent centers give students a chance to be hands on while learning the names and attributes in a fun way! 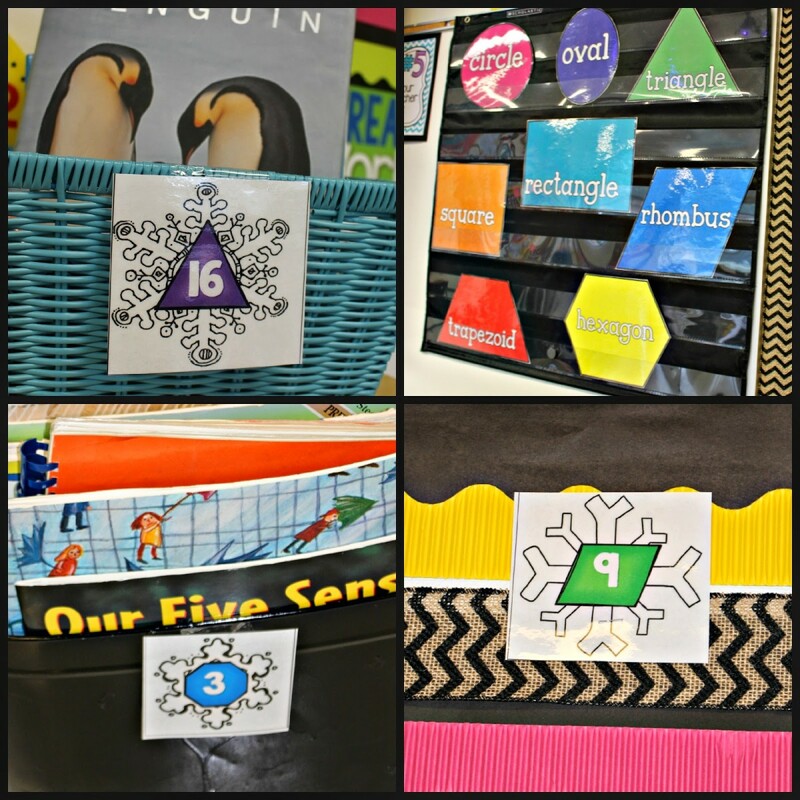 I placed these snowflake shapes all around the room so students can “catch” snowflakes! 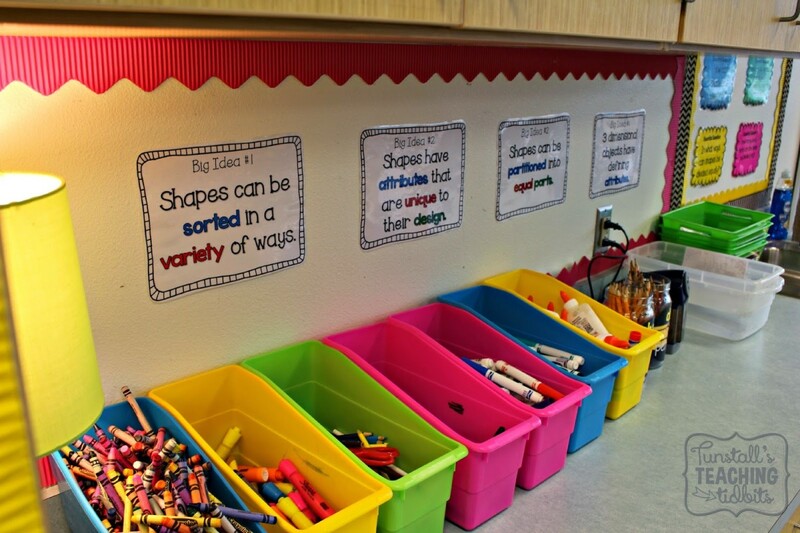 They will use the reference walls to record the shapes they find around the room! It’s a perfect way to kick off our studies! Posters found here. For my fast finishers, I restocked our expert tubs. These are recycled centers of the past. Students are encouraged to take it to the next level. They usually come up with better ideas than I do! I love seeing them “play teacher” with the different activities. A little peek into our expert tubs. Both literacy and math live here. These are for early finishers all day long. We keep the learning interactive as much as humanly possible! I love that they stack away when not in use! Grab the labels for your own expert tubs on my facebook page under the freebie tab! You have to be on a PC to be able to grab them! Apparently facebook and tablets are not bffs. I got the tubs at the dollar store this summer. They still have some of the same tubs there now. I just went there the other day and grabbed some yellow ones! 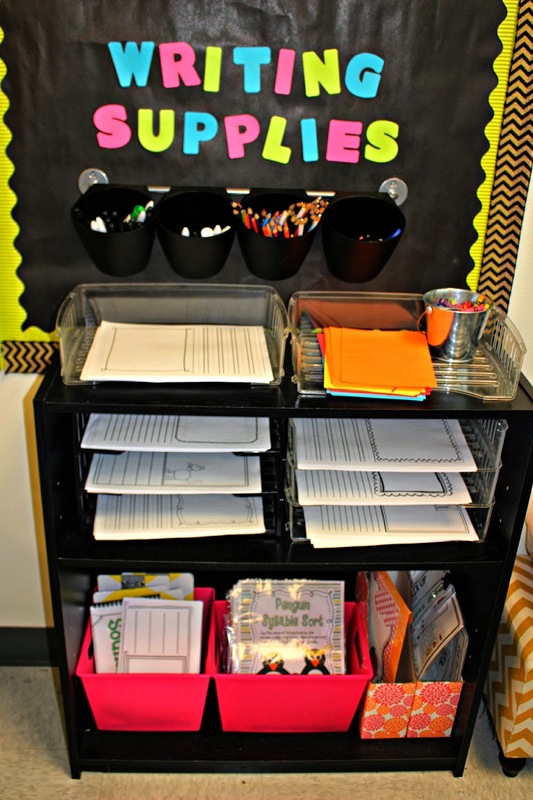 Another fun area that got some love today was our writing center shelf! 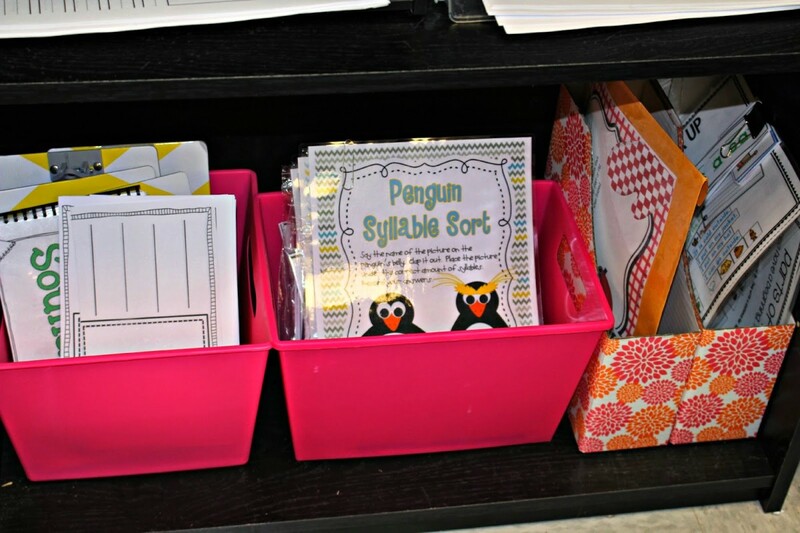 I added a big variety of paper to the trays and updated the center choices to our jam packed January centers. This paper all comes from here. 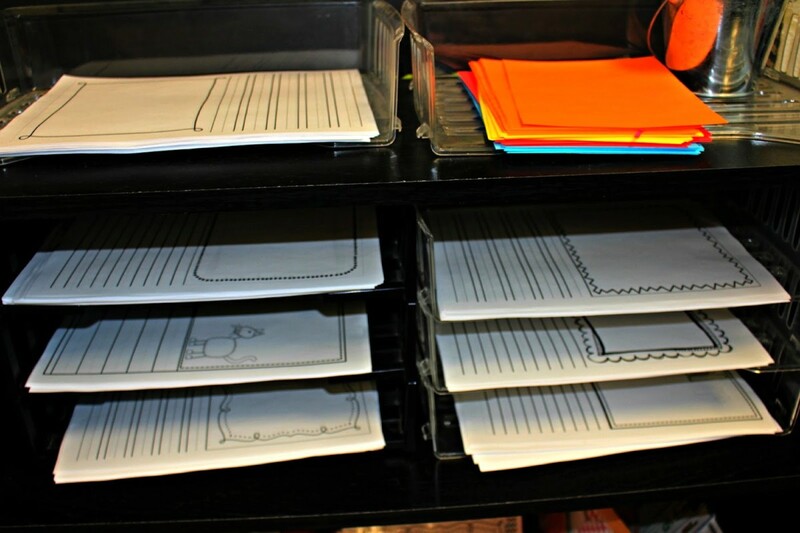 The bottom shelf has items that students can get into on certain days or as a second activity if they have time. 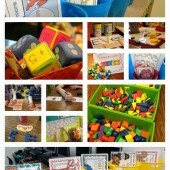 I stock it with literacy centers and writing activities that they can do independently yet will reinforce past learning. 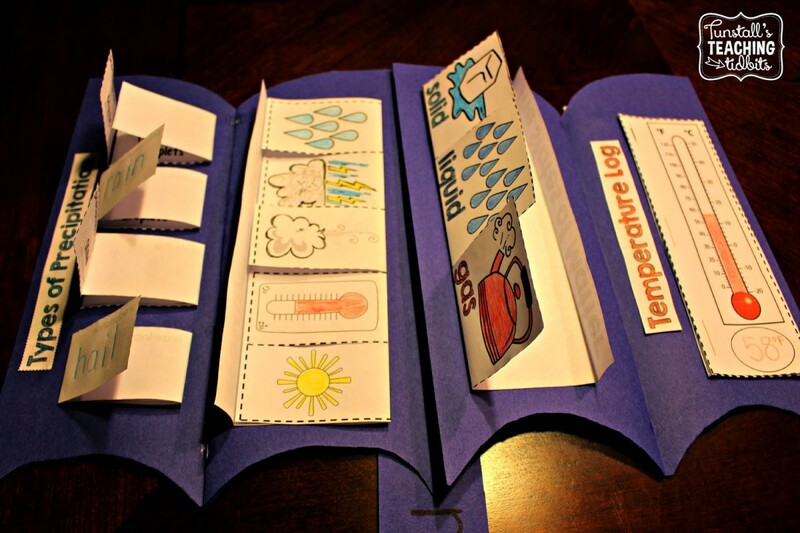 I brought home the materials to prep our weather umbrella books! We will be working through these books for 2 weeks! 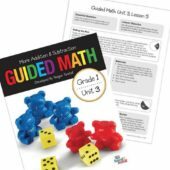 This cute little book is full of cross curricular connections! I am busy working on the third iPad Essentials series. This one will be all about research! First up students will have a blast researching weather around the world! Cristina and I are putting the finishing touches on this unit this weekend! How are you preparing for the return?! I love your ideas!! I SO want to be you when I grow up! 😉 Like you I am in Texas and was wondering about your "Big Ideas" and "Essential Questions" Where do you get these from? Do you just know from years of teaching or do they come from your curriculum? 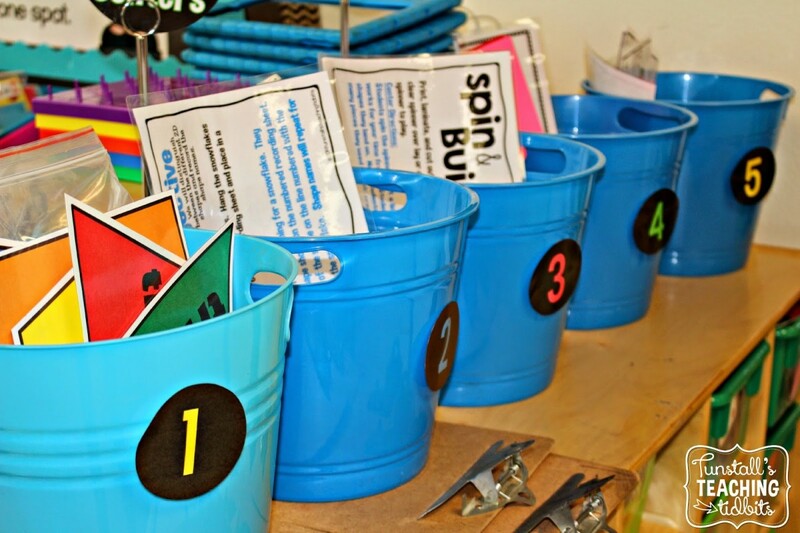 What does it look like when you are teaching and using these in your lesson? Hey girl these are from the TEKS! Think of it as just re-framing the standard into a statement or a question. I am not terrific at remembering them unless I put them up! It helps group standards and gives me a focus for a few days at a time. 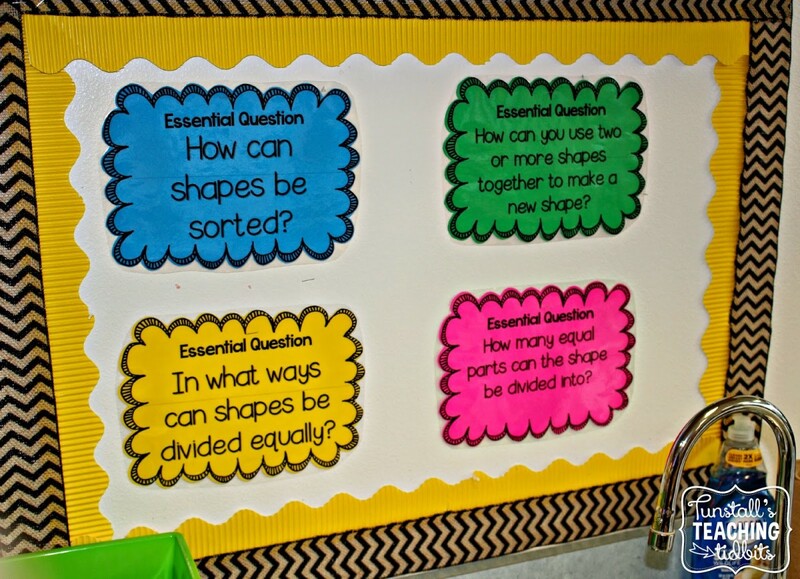 I sometimes use them as a lesson focus where I ask a student to answer an essential question before we move on or I ask someone to tell me more about one of the big ideas. Just to get that thinking going on target. Hi there! I was wondering if you could tell me the brand and type of cutter you use in the picture with the contraction snowmen? I have been looking for one for a while that would be strong enough to cut my laminated pages. I got the cutter at costco. My husband came home with it one day. It is the only one I have ever seen there. I love your room – and the bright colors! You always have such great ideas! I am amazed yet again!!! I just bought some stuff from you the other day, so I can't wait to get back to put it all together. Love the expert tub idea!! Also, I can't wait for the iPad Essential 3 to come out!! Thanks so much for your inspiration! I also went to my room today! I only moved my kiddos tables AND hit my "I'll do that during winter break" list. Feeling much better, maybe I'll sleep tonight. One question, I love the idea of the Expert Tub. 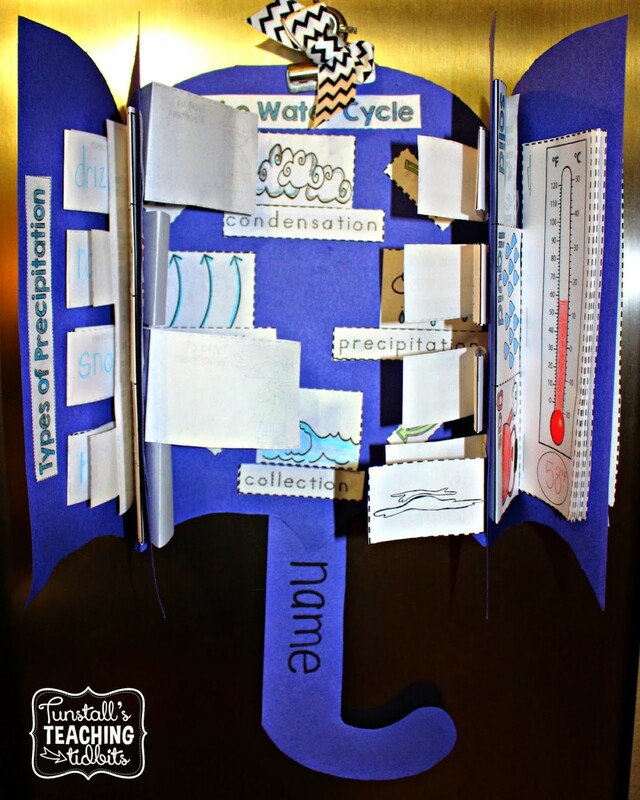 Do you leave the interactive activities open for the kiddos? Ask them to come up with a new way to use the materials? Great way to inspire creativity and creative thinking!! So where did you get your large posters in your reading area? Love your stuff–added more things to my wish list. My students love it when we do one of your booklets! 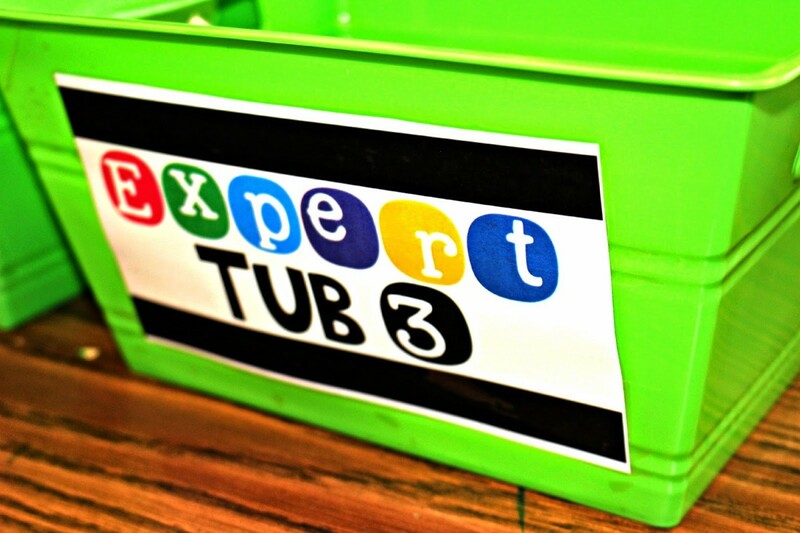 I love the idea of an Expert Tub. Where do you get the activities and what type of activities do you include? Thank you for continuing to share your ideas! 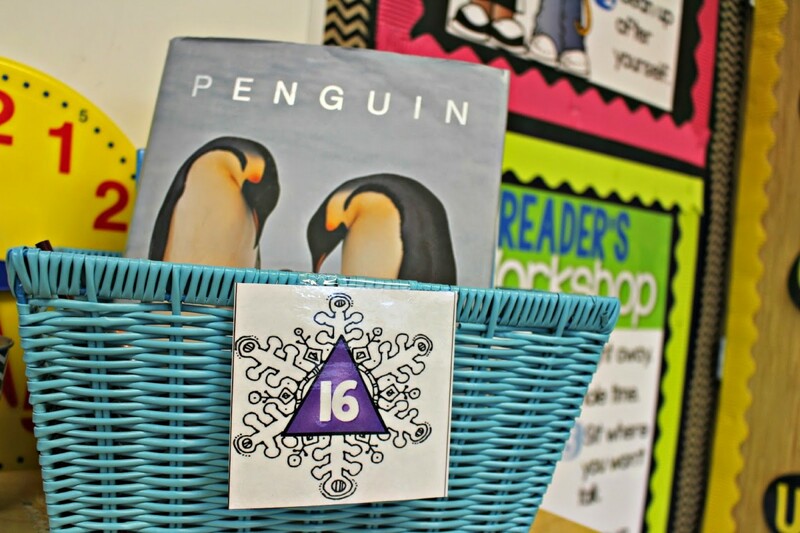 As a new teacher, I'm finding your blog very helpful! I put very simple things in the tubs. flashcards, match up cards, anything from the centers that we have already worked on. 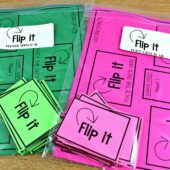 Sometimes students take it to the pocket chart or just do it on the desk or floor. 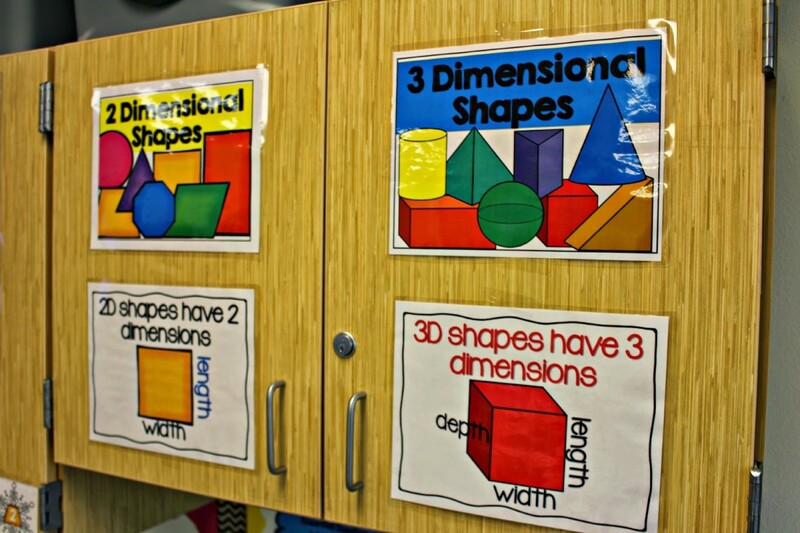 We are doing shapes when we go back too. 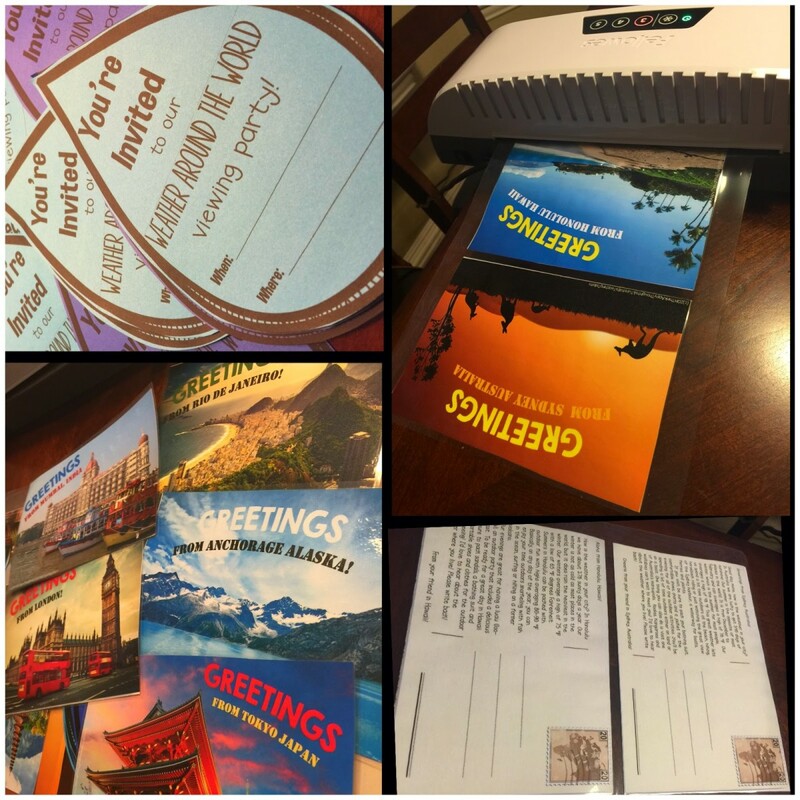 Thanks for all of the ideas and TPT products. Now I've got to find those black pocket charts…LOVE! I looked on your FB page for the Expert labels. I am on a Mac… I saw some but not all… Love all your products. I can't find them either! I didn't see them on the freebie tab at all. 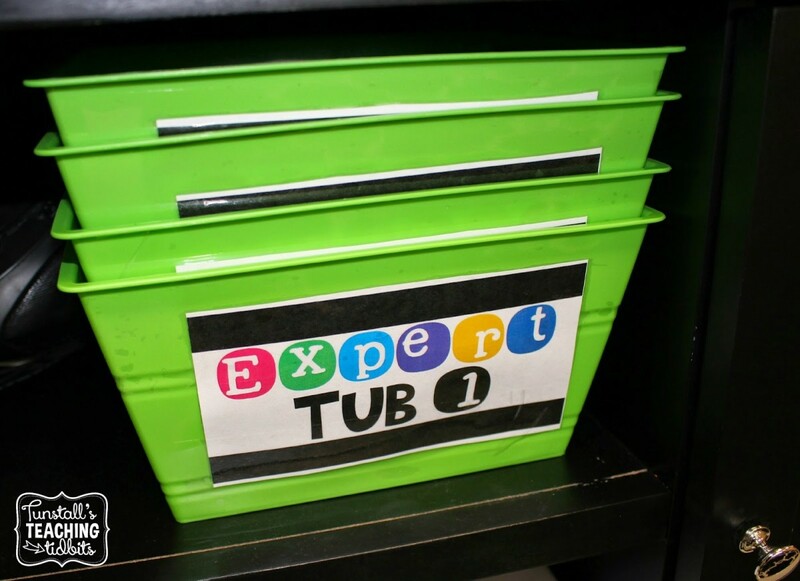 I love the idea of expert tubs! I have something similar I'm using but it's a little chaotic and this seems so much more organized! 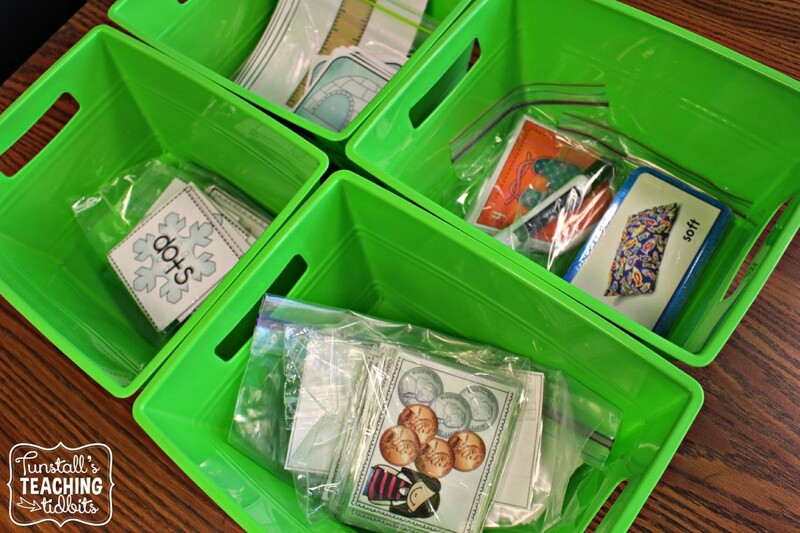 Does each baggie contain a game/activity that the kids can just grab and go with? How many do you have out at a time? LOVE IT!!! I love the idea of expert tubs. I could put in games from the previous week! That would be awesome to use games more than once. I'm not sure why I haven't thought of this as an early finisher activity. I have 5 computers so I regularly use that as their early finisher. Especially if they are a struggling reader because it gives them actually lessons targeted on their level. I will use this for those that don't need to go on computers though or don't want to. THANKS! Hope you have a great start to your year! Looks like you're ready to go! I am also on a Mac and I can't find the expert labels either! I love the idea! I saw 10 freebies on your Facebook page, but I couldn't find the expert labels anywhere! You are amazing! I personally don't know one single solitary teacher who went in and set up their classroom to be ready upon return. You are truly "one of the good (I say, excellent!) ones"! I would LOVE to be a kid in your class. I would DEFINITELY love to visit and witness all the awesomeness!!!! 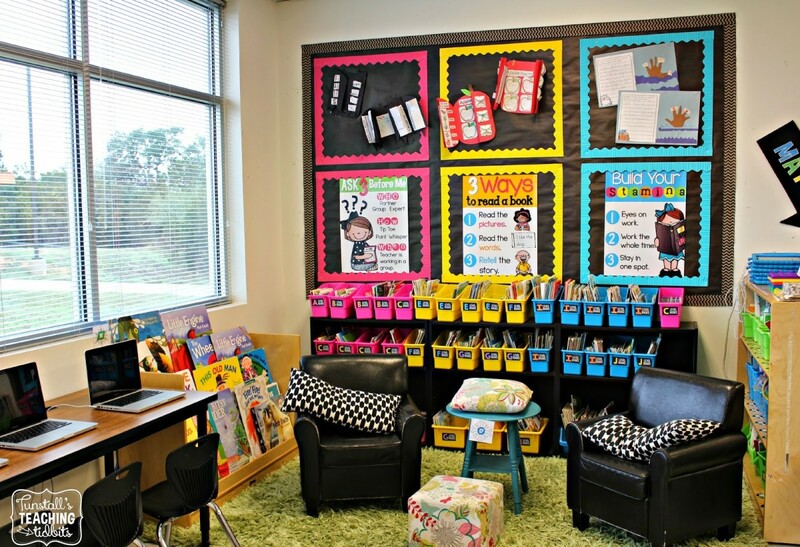 Your classroom is the CUTEST! 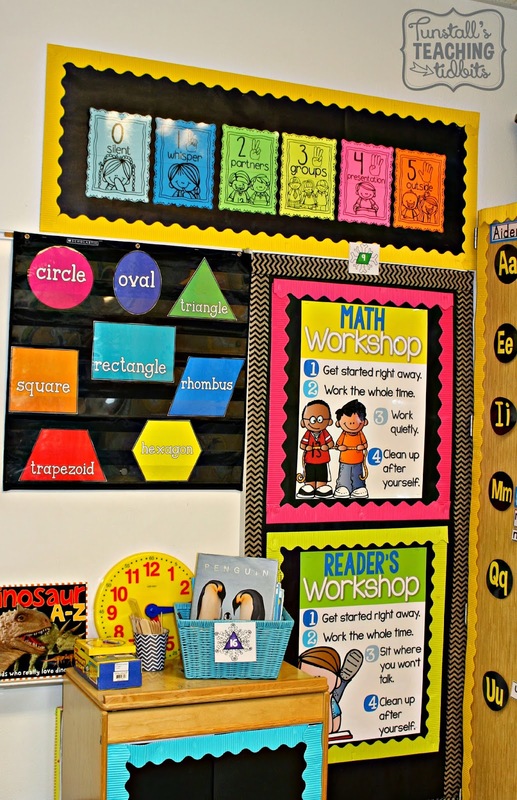 I am a homeschooler now, but I remember the days of setting up my classroom…your students are BLESSED! Happy New Year Reagan – thanks for keeping first grade teachers motivated!! If you click the picture of what you like I have made it a clickable link. It will take you to where you can purchase it. Where did you get the "how to ask 3 before me" poster? I love it!